If you are not well-versed in the wide variety of peppers, you probably don't know the level of spice each type of chili pepper contains. Whether it's a poblano (dried are called ancho), jalapeño, habanero, or serrano, each has different degrees of heat, which is determined by how much capsaicin (a compound responsible for the pungency) is present in the pepper. Luckily, this capsaicin can be measured in Scoville Heat Units, or SHU, on the Scoville scale. This scale lists the peppers by how may SHU are in each pepper, from the thousands for milder peppers all the way up to the hundreds of thousands and even millions for the spiciest varieties. 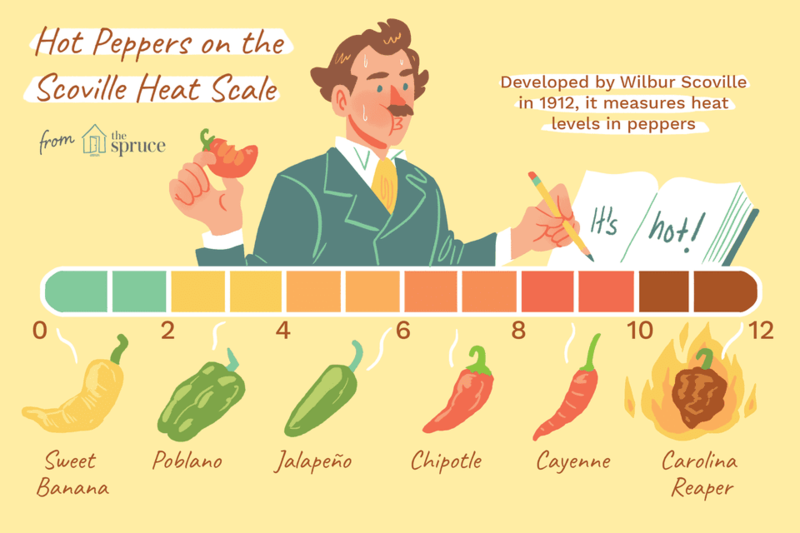 The Scoville Heat Scale is a measuring tool developed by a pharmaceutical company employee named Wilbur Scoville in 1912. His original method was called the Scoville Organoleptic Test and used human tasters to evaluate how many parts of sugar water it takes to neutralize the heat. The pepper would be ground up and then mixed with the sugar water. The testers would taste the pepper-water mixture, and the sugar water would then be increased until the pepper was no longer hot to the taster. The peppers would be given a numerical value based on the number of times the dilution was added to mask the heat. For example, if a pepper is rated at 15,000 SHU, it took 15,000 additions of sugar water for the taster to no longer feel the burn. Unfortunately, this procedure was not very reliable and completely subjective. Nowadays, human tasters are spared, and a new process called High-Performance Liquid Chromatography (HPLC) measures the number of capsaicinoids (capsaicin) the pepper contains in parts per million. The American Spice Trade Association (ASTA) uses HPLC and then assigns an ASTA Pungency Unit as a measurement of the heat detected. These units are then converted into SHU—1 ASTA unit is equal to 15 Scoville units. Although the current method of measuring chili pepper heat is much more reliable than the previous technique, there is still room for variation. The conditions in which the pepper grows will affect the level of spice in the pepper; so if the same type of pepper was grown in different types of soil with varying amounts of sunlight, the amount of capsaicin will differ. There is also some question on the accuracy of the conversion of from ASTA units to SHU. Even so, chili pepper aficionados are locked in intense rivalry to create the world's hottest pepper. Since 2011, when the competition began to heat up (pun intended), the title of hottest pepper has changed hands a number of times as new crosses and genetic mutations have emerged. In 2013, the Carolina Reaper was named by the Guinness Book of World Records as the world's hottest pepper, and peaks at 2,200,000 SHU. On the Scoville scale, different pepper varieties are categorized into heat ratings, with 0 being the mildest and 12 representing the highest heat.